Corporate Business Impact Analysis-Why Bother? In this session we will look at practical examples of how businesses have used a corporate-level BIA as a foundation for all of their business continuity activities. It is well known that understanding the threats, risks and impacts is key to building a sound and cost effective business continuity strategy - in this session we will build on that premise and show how a corporate level BIA can also be used to get executive level buy-in, funding and can then drive the whole of the business continuity programme. 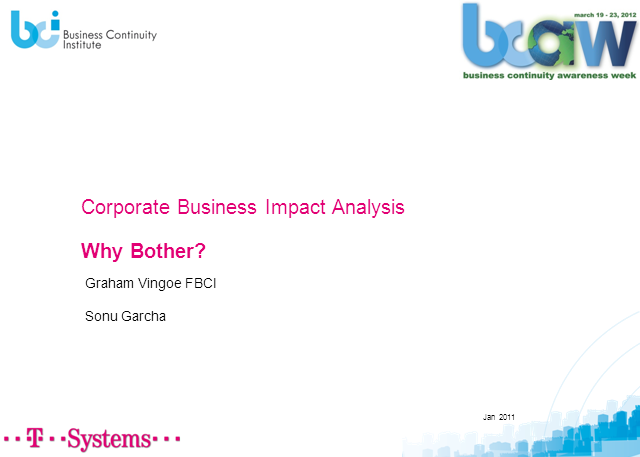 Title: Corporate Business Impact Analysis-Why Bother?